HONOLULU, Hawaii, Sep 8 2016 (IPS) - Japan and South Africa have ignited a furore at a major conservation congress by coming out against a proposed appeal to all governments to ban domestic trade in elephant ivory. Elephants in Africa are being killed by poachers for their tusks at the rate of one every 15 minutes, according to the results of the recently released Great Elephant Census. A motion that would seek to halt the domestic trade in ivory was seen as one of the most significant and contentious to be voted by delegates at the IUCN World Conservation Congress in Honolulu. But Japan and South Africa expressed their opposition to such a ban on Wednesday when a contact group of government and NGO representatives attempted to hammer out an agreed text of a resolution sponsored by the United States and Gabon. In a sign of the sensitivity over the motion, the media was expelled from the conference hall by the International Union for Conservation of Nature chair of the contact group. Negotiations continued into Wednesday night but the Japanese and South African delegations walked out of the talks after the session decided to stick with the original strong wording of the motion calling for a ban. A vote by the plenary session of the IUCN congress, which convenes every four years, is to be held on Friday. Conservationists from NGOs pushing for the ban on domestic trade were livid at the attempts by Japan and South Africa, backed apparently at times by Namibia, to significantly water down the motion. “This is atrocious,” commented Mike Chase, founder of Elephants Without Borders and the principal investigator for the Great Elephant Census carried out in 18 countries. “Six elephants were killed while they were deliberating over one sentence,” said Chase of the first 90-minute session, checking his watch. Japan and South Africa say they are just as much for saving Africa’s elephants as everyone else but that the right way forward is through regulated and tightly controlled domestic trade, not a ban. “Regulating is fiddling while Rome burns,” commented Ms Lieberman. Naohisa Okuda, director of the Biodiversity Policy Division of Japan’s environment ministry, said a ban was “not appropriate”. “We have to stop all the illegal trade. It is not necessary to ban legally traded ivory,” he told this reporter, giving the example of ivory imported by Japan before the 1989 ban on international trade in ivory came into force. “The problem is identifying what is legal and what is illegal,” he added. He said the international community should find an effective control system for the trade of ivory, which could be used to benefit conservation of African elephants. “The Japanese control system is very good and highly effective, as the IUCN recognises,” Okuda said. “Other countries should follow.” However some activists dispute this and question the amount of carved ivory artefacts produced in Japan. South Africa argues that its elephant populations are stable or even growing and that culls are needed, with the proceeds from ivory sales going to conservation efforts. The government has also held one-off sales of ivory stocks, but activists say these sales have triggered a spike in raids by poachers. Morgan Griffiths of the Wildlife and Environment Society of South Africa said that despite the sophisticated technology used in Kruger National Park, poachers were increasingly trying to infiltrate from Mozambique where they are driving the elephants to extinction. But South Africa’s conservation efforts are “totally stretched” protecting the endangered rhinoceros from poachers and Griffiths is among those urging the government to accept a ban on all domestic trade. 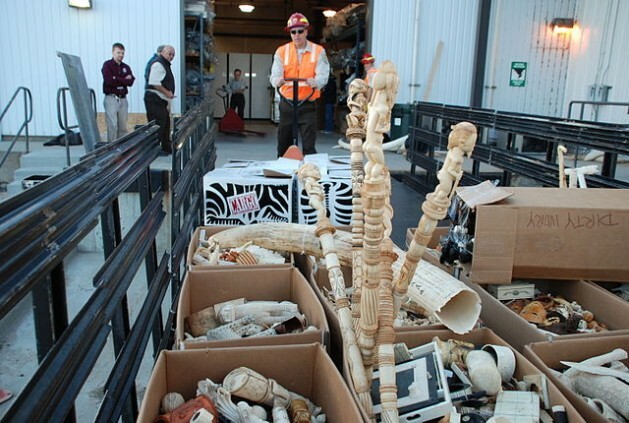 “One-off sales of ivory will trigger massive outbreaks of poaching,” he said. Other African countries are calling for the ban on domestic trading of ivory, knowing that as much pressure as possible must be brought to bear on China and Vietnam, the main importers of illegal ivory, to stem demand. The IUCN, whose voting members include some 1300 NGOs and governments, does not have the legal authority to impose bans on domestic trade. But such an appeal by the world’s most authoritative conservation organisation – if broadly supported — would carry considerable moral weight and put pressure on governments to act. Motion 7 on ivory is among several contentious issues under debate at the IUCN Congress. Others include proposals to create “No Go” areas, such as indigenous peoples’ sacred sites, with stricter protection laws; to set up marine reserves for 30 percent of the world’s oceans; and policy guidelines for “biodiversity offsets” by industrial companies. China is by far the biggest consumer of illegally smuggled ivory, much of it passing through Hong Kong and Vietnam. A year ago China and the US announced jointly that they would enact a ban on their respective domestic ivory trade. China has not given a timetable, however, and has remained silent during the debate in Honolulu. Hong Kong says it will ban its domestic trade by 2021. “It is unconscionable that these animals are being killed for vanity and trinkets. To stop the trade in ivory we have to stop supply and the demand side,” said Tony Banbury, chief philanthropy officer of Vulcan Inc which was set up by billionaire philanthropist Paul Allen and funded the Great Elephant Census. The Great Elephant Census, an aerial survey that took almost three years and tracked 350,000 square miles, showed that savanna elephant populations in 15 countries had declined by 30 percent – equal to some 144,000 elephants – between 2007 and 2014. The rate of decline is accelerating and is currently running at an annual 8 percent primarily due to poaching, meaning that some 27,000 elephants a year in those countries are being slaughtered for their ivory. Comparative data did not exist for three countries. The sharpest declines were seen in Tanzania and northern Mozambique.